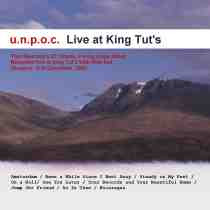 The album was recorded at the legendary Glasgow venue on the 21st December 2003 at what was Tom (u.n.p.o.c.) Beauchop's first ever gig. It features 7 tracks off of his phenomenally good "Fifth Column" album. Plus two non-album tracks, one of which Matt is itching to hear! Tom's band for the night was none other than Fence buddies King Creosote, James Yorkston and The Pictish Trail. Surely this is reason enough! Here's one of the non-album tracks called "On A Roll" which Tom wrote especially for the gig! A numbered copy of Live at King Tut's can be bought here for the bargain price of £6.00 and my 'desert island disc' Fifth Column can be had off Amazon.co.uk.